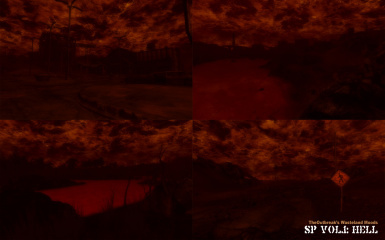 cant get Hell edition to work (not silent hell) i mean the apocalyptic red hell weather. no idea why its not working. 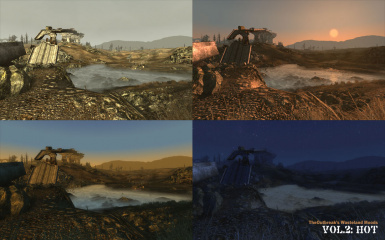 Ok so, I remember being able to change the colors of specific parts of each weather preset by using some kind of color picker in FO3edit, however I can't seem to find it when I open the mod file in FO3edit, I can only find (red,green,blue) with number values. Any help? Really love IDOV weather, it's fantastic. 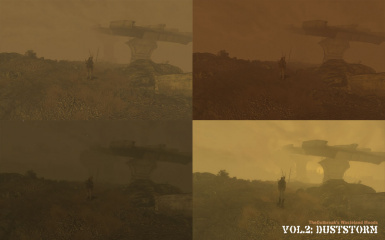 Hope, someday I'll see Fallout 4 version, still can't find good dark mood. Weather mods are probably the most touchy things when it comes to this game. 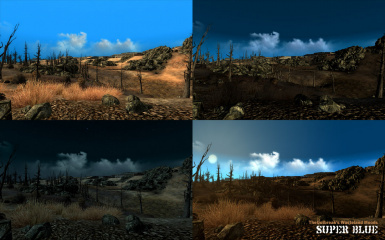 That being said, I really have to endorse the Visari sky mod from the Wasteland Moods series. It's really immersive and fits the Fallout environment perfectly. I highly recommend it... with caution and certain key points. If you're looking for a constant good look and a weather mod that goes perfectly with Enhanced Rain and Snow, then Visari is your choice. I found the transition between both mods to be flawless. It's like they were made for one another. It's amazing how the two transition between each other, without any visual glitches, at all. 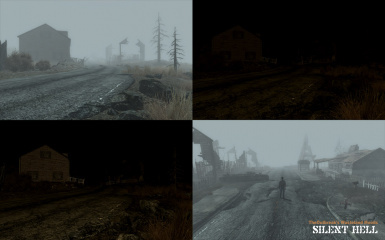 Unfortunately, like other weather mods... Visari can cause critical conflicts with other mods that place objects in the wasteland, so be careful. 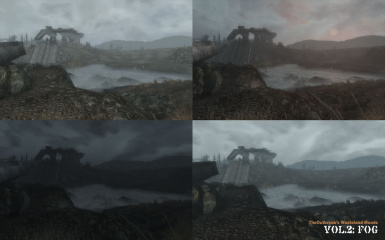 The problem is the world space edits of any mods that you might be using. 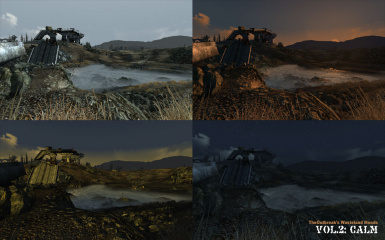 You can see if this mod is going to conflict with your other mods by running a conflict report using FO3Edit. If you do run into any critical conflicts and can't sort them by load order...then you'll want to decide which mods you want to give up in order to use Visari. You can chance running these critical conflicts together and you may be alright, however the chances that you'll cause ctd's in your game is greatly increased. I highly recommend loading the Visari weather mod below your merged patch. Otherwise you will run into glitches with it. For instance, the weather going back to default for a short time. I would even load it below Blackened, which you should be running below the merged patch as well. Also, expect your nights not to be even "vanilla" dark. The nights come off warm feeling and rather bright around the character, however it does play really nice with the street light mod. It's a really different look for the game. 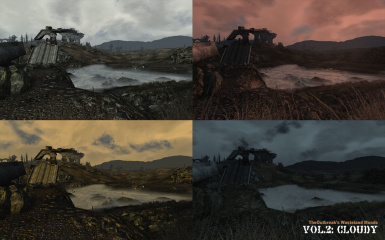 Use the Imaginator mod to adjust your visuals too. Kudos to The Outbreaks for Visari !! Pro Tip: I recommend running any weather mod below the merged patch, that doesn't utilize an esm file. Great mod ! Thanks ! I have followed instructions, but cannot get it to work in game. 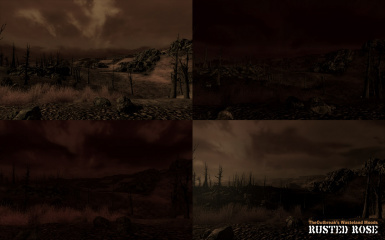 I have place the Hell version in Data folder, activated via FOMM, opened Fallout and the sky never changes. Is this common? 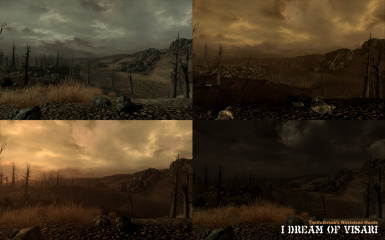 The Infernal Sky mod works for me. But this doesn't change anything when activated. It looks awesome though! EDIT: My goal is to install the Visari version. It looks great! It just doesn't show up in game when activated. I have it at the bottom of my load order. How do I use the fog weather only, I follow your instructions by selecting only one, yet the fog doesn't appear, what should I do? My only problem is that sometimes in the exterior world the IDOV Mood seems to fade from the sky and revert to vanilla for like 5 minutes or so then comes back? any reason why? The silent hill blackouts are frickin annoying. The Wrye Flash Patch can neutralize this mod. I tried the single weather fog to no avail.